This page will provide space for those buildings that have since been razed or replaced by school districts which are still in operation. So many of our memories of our school days center around the high school building we attended and its unique character. If you attended high school in a special building that has been replaced by a more modern building write to us and let us know. We, as always, are looking for photos to share of your high school building. Some buildings, like the first one we will list, have great stories regarding their contruction and development. We hope you will share this information with us as well (ihsgdwebsite@comcast.net). 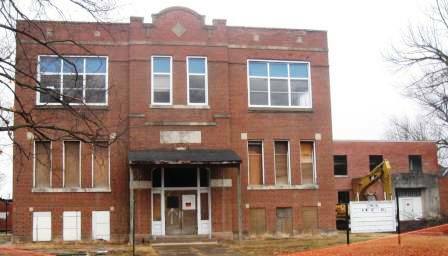 LaMoille Allen School Building, Bureau County, IL. 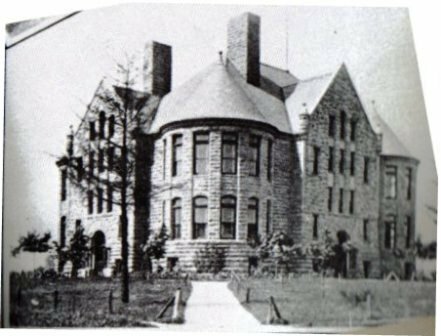 This article states that the Allen School was built in 1887. It is still in use as the LaMoille Junior High School. The building is also on the National Register of Historic Places. The building once served as LaMoille High School as well. The building pictured above was the original Payson Seymour High School building. It was submitted to us by a good friend of the Glory Days site, Richard Heitholt. 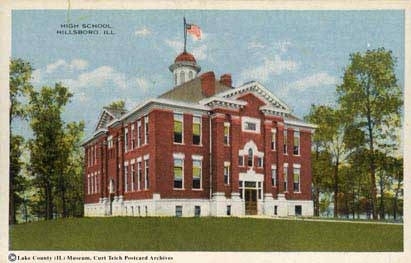 This is the Seymour High School building of Payson which was dedicated in 1916. The building was financed by the Seymour family and dedicated to Charles Seymour who was killed in the baseball accident in 1915 at the age of 16. The Seymour family also built a library for Knox College. This building now serves as a grade school for the Payson Seymour School District. 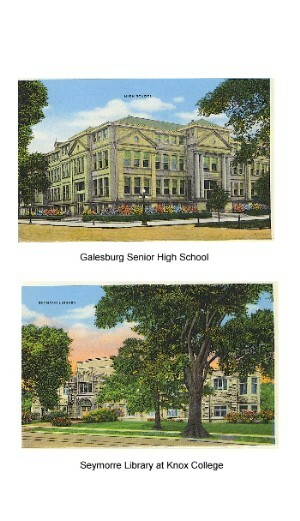 Galesburg's 2nd high school buiding is at the top of the photo above. "Galesburg built a new HS building and closed the old one in 1959. A few years later the old building burned to the ground. The old school had a building called Steel gym with a boy's basketball gym and swimming pool and identical facility for the girls. There was also a separate building for Home Ec. The new school had a gym and no swimming pool." 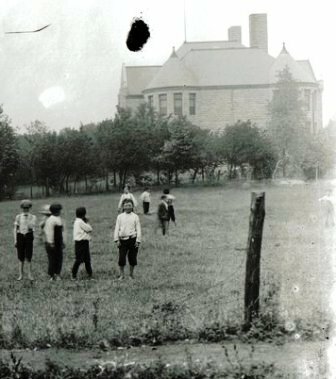 Patty Mosher tells us; "There was a previous high school (prior to the one pictured above) which was built in the 1800's and burned to the ground in 1904. The second high school opened in 1905 which is the post card you show here." The Seymour Library is in the bottom of the photo above. If you read the excerpt from beneath the photos of the aforementioned Payson Seymour High School Building, you know that the Seymour family donated the money to build the library at Knox College. Granite City (population 31,303) is located in the southwestern Illinois in the southwestern portion of Madison County. 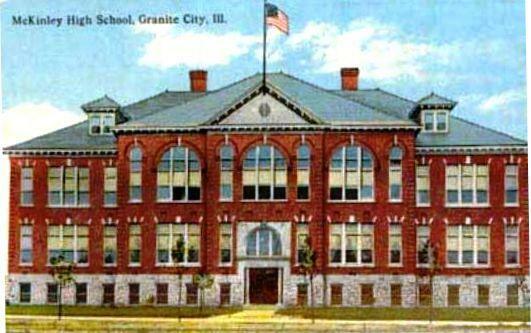 The McKinley School, built in 1906, was used as a high school and grade school in Granite City for many decades. It was razed in 2009 or 2010 to make way for a new health care facility. "The two photos above show the original Hillsboro High School and the current structure although a separate structure (new Gym, indoor track, and several classroom for band, industrial arts and Agriculture were added in 1938-1939 in the area immediately to rear of the main building. 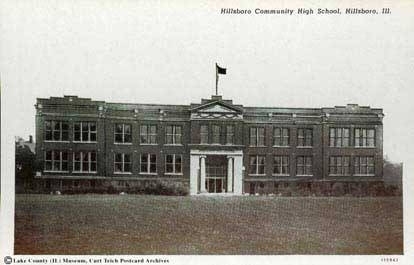 When the Hillsboro Community High School opened approximately 1939, the older high school began functioning as the city's Junior High School. Students were later transferred to a new facility abutting the property where the current high school sits. That alignment occurred in 1954-1955 time period." Joliet (population 129,519) is located in northeastern Illinois in west-central Will County. In fact, is the county seat of Will County and spills over into Kendall County to the west. Joliet was platted in 1834 and officially incorporated in 1852. After much discussion over the town's early name (it was known as Juliet from 1834 to 1845), Joliet was settled upon to honor Louis Joliet, famous explorer who first viewed the area in 1673. A number of routes have served as ways to reach Joliet, including the legendary Route 66, which was replaced by Interstate 55, along with Interstate 80, US Routes 6, 30, 45, 52, and Illinois Routes 7, 53, and 171. The rail service has been provided by the Elgin, Joliet, and Eastern (EJE) RR, along with the AT & SF RR, & the former Rock Island RR, which shut down in 1980. "Built in 1895 after a former school building of wood burnt down. The Moran School was 41 years old when it burned down in the early morning hours (3am) of Wednesday July 29th 1936. The 12 classroom school housed 400 kids. It was insured for $51,300. Included in the loss were 25 tons of coal stored in the basement. Nothing was saved but some of the Limestone which was used for landscaping around the schoolyard. M. J. Cunningham was the Principle. There were all women teachers. Miss Burger, Miss Alberta Banzet, Miss Murphy, Miss Trainor, Miss Johanson and Miss Ford. The current M.J. Cunningham school now occupies this spot at 500 Moran Street." Lawrenceville (population 4,348) is located in southeastern Illinois in the east-central portion of Lawrence County. U.S. Route 50, 250, and Illinois Route 1 will all lead you to and from Lawrenceville. The Baltimore & Ohio and Conrail railroad lines pass through town as well. Lawrenceville was named after navy commander Captain James Lawrence. 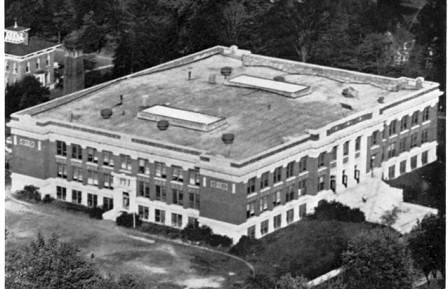 The Lawrenceville High School building pictured above served the community for 99 years. The school opened in 1914 and saw its last graduating class in 2013. A more modern school building has been erected in Lawrenceville to take its place. "The school was in operation from 1914 to 2013. It saw some incredible glory days with State Champion Basketball teams in 1972 & 74 and undefeated teams in 1982 and 83. With 68 games straight to the top 2 years in a row. In 1974 it brought home a 3rd place in the state basketball championship, all under the guidance of Coach Ron Felling. Our town built a new high school and this building was sold in January 2014 to an individual from Missouri. What is to become of it remains to be seen." The original Marissa High School building is pictured above. Marissa is a town of 2,100 residents and is located in St. Clair County in far southwestern Illinois. James Horaz snapped these photos in early 2011. It is a good thing he did as it has since been torn down. To view the new and improved Marissa High School building check out http://www.marissa40.org/ . Moline High School --- Before the current Moline High School campus was built in the late 1950s on 23rd Avenue, Moline's high school was housed in two different buildings. The picture on the right was MHS from 1894-1914, and the picture on the left was MHS from 1915-1958. The 1915 building still stands, now used for lofts. 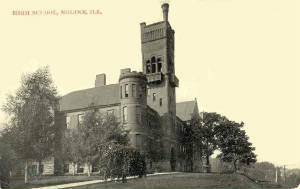 MHS 1894-1914: The most prominent school building in the history of Moline School District No. 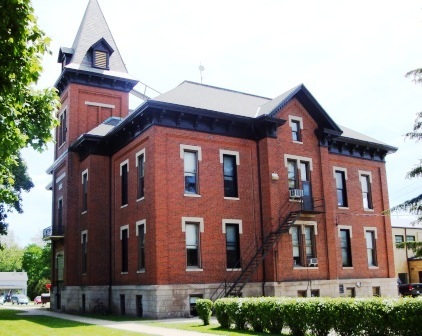 40 was probably the Moline High School building, erected in 1894. This imposing structure, which overlooked the Mississippi River on a hillside between 15th Street A and 16th Street north of 11th Avenue, was known as "The Castle" to barge and river boat passengers who could see the twin turrets of the brick building as they traveled on the Mississippi. "The Castle" served as the high school for twenty years. 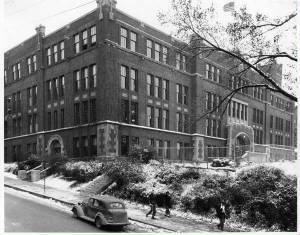 MHS 1915-1958: In 1914 a new high school was built on land adjoining the site of "The Castle". The former high school then became Central Grammar and served as a citywide eighth grade school. In the early 1930's, John Deere and Calvin Coolidge schools were built as three-year junior high schools, and old Central was converted to an annex with classrooms for the high school next door. In the next decade, it was used infrequently as a classroom annex until the Moline Community College used its space for classes. In the forties, the basement of the annex became known as the Rek --- a large recreation center for Moline teenagers. Wheeling HS Building 1925 - ? http://www.wheelinghistoricalsociety.com/album0/history1.htm . They were submitted by Sarah MacIsaac, a fan of the Glory Days website. A portion of the building to the right is still in use as a school in the Wheeling School District.